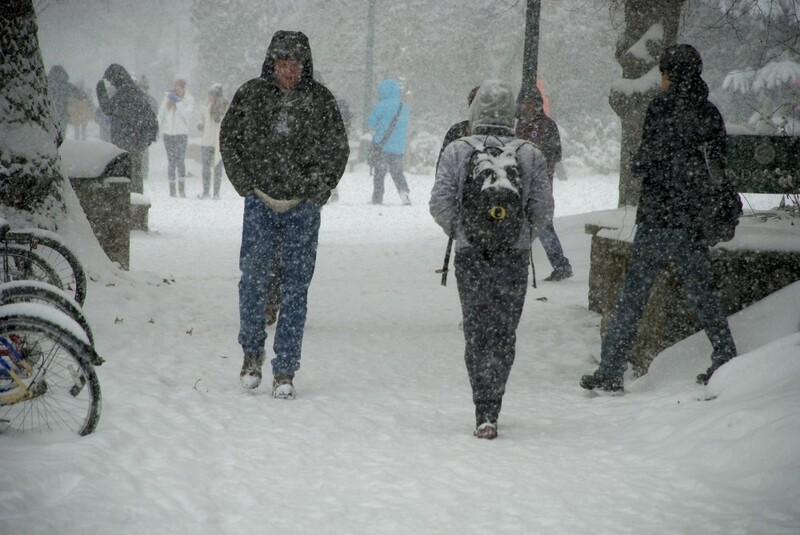 Throughout the cold winter months, the Eugene area often experiences dangerous weather— floods, snow storms, icy roads, you name it — which may prevent UO employees from getting to campus. In the interest of being prepared, it’s time for a refresher on the university’s inclement weather procedures. In some instances, classes and campus activities may be cancelled for all or part of a day. If this is the case, the UO home page will have a banner at the top of the website, and those registered with the university’s text messaging system will receive a notification on their phones. Email alerts also will be sent to all uoregon.edu email accounts, the UO Alerts webpage will provide accurate information and the inclement weather phone line (541-346-9000) will have updated recorded messages about the status of campus operations. Additionally, tune in to local television and radio stations, which will provide school closure and delay information. Delays and cancellations are made on a local basis. For the UO Portland campus, Portland State University will make the call. The UO Bend Center will follow the lead of the Bend/La Pine School District, and the Charleston decision is made by the Oregon Institute of Marine Biology. While local public schools and child care centers may close due to inclement weather, the university might still be operating. Please refer to the UO’s Family Support Policy for more information on how to handle that situation. If travel conditions from the employee’s home are too hazardous, it is expected that they will make a personal judgment on whether to come in to work or not. Employees who are unable to report to work because of inclement weather or because the university has closed may use accrued vacation, compensatory time, exchange time, personal leave or leave without pay to cover the missed work time, if applicable. If a faculty member cannot make it to campus, it is their job to notify their students in a timely manner. Additionally, if an employee works in an essential services position — such as the dining halls, central power plant or public safety — their managers need to notify them of their required presence even if campus is closed. For any additional questions, contact the department director or a direct supervisor. Questions may also be directed to the Human Resources Service Center at 541-346-3159.